This weekend past, the freaks and geeks of the world came out in full force to enjoy all of geekdom at FanCon Comic Convention in Cape Town. 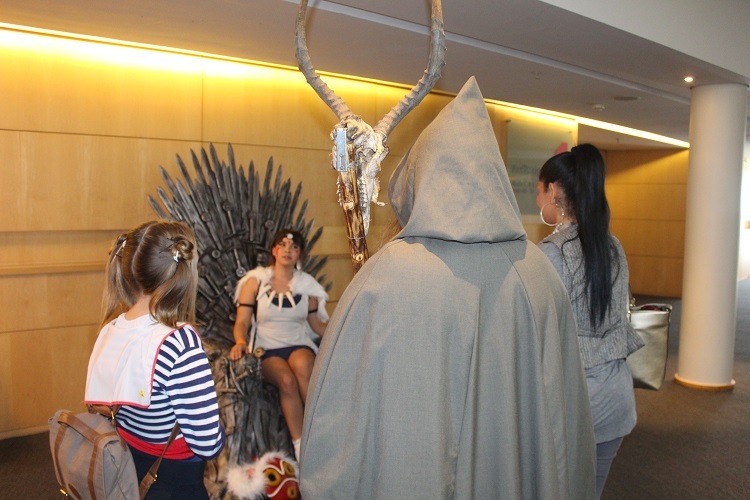 The event took place at the Cape Town International Convention Centre (CTICC), and featured a host of activities including comic book stalls, collectables and merchandise, panels with local and international guests, talks, cosplay and more. After having the full weekend experience last year, I decided to approach this year slightly differently and only attend the Saturday. I also decided to cosplay this year and went as Josie, the lead singer of Josie and the Pussycats, largely based on the cover of Josie and the Pussycats #2 (2016). In keeping up with our theme, I was also joined by two other Riverdale characters, namely Cheryl Blossom and Betty Cooper. There was so much to do at FanCon this year that it was great that they moved it to a bigger venue at the CTICC – from various panels on women’s representation in comics to cosplay workshops, to dozens of stands filled with comics and collectables (my favourite purchase this year was a Death Note pocket watch/necklace which I am obsessed with now). There was something for everyone and it literally took all of my willpower not to buy everything in sight, but somehow I managed to get through with very little damage to my card. Like at the inaugural FanCon, I had an absolute blast at the convention. It’s always so great to walk around and see so many people with shared interests come together to have lots of fun, and even more wonderful to see so many people seated around the CTICC reading comics and cosplaying in a safe, welcoming environment. And the cosplay! Although I missed the main parade, some of the costumes I passed were amazing and I am in awe of everyone’s dedication and creativity – my favourite had to be Star-Lord and Gamora (followed closely by the Starburns I saw on my way out). All in all a wonderful experience, and I cannot wait to attend again next year! I’m not gonna lie, when I walked in I was expecting the floor space to be much bigger. This was a result of attending EGE last year, which was in the main hall at the CTICC. I mean, there’s enough crossover with these two events to have some expectation, right? However, Decorex was taking place there. Regardless, I was not disappointed by Fancon. I quickly found myself milling through the aisles of stalls as I searched for items I fancied; adding them to my mental inventory and doing calculations as to what I would be able to get at the end of the day. Another thing I was super excited for was finally getting my picture taken on the iron throne from Game of Thrones. If anyone knows me, they’ll tell you I’m a bit more than a huge fan of the show. Last year I didn’t make it to FanCon, so this year when I walked in, one of the first things I did was photograph myself upon the most glorious iron throne. Much excite! But that’s not the best part. It… TALKS! Yes, it frikken talks! I was super excited when I found out. And the best part is that I got this at a superbly discounted price (but I won’t kiss and tell). My contribution to the local comic scene was picking up a preview of a self-published comic written by a friend of mine who I attended university with. It’s called Blenderboy, and it’s written by Jayson Geland (my university buddy) and illustrated by his colleague and friend Warren Raysdorf. It’s a pretty crazy concept, featuring a post-apocalyptic world where people have blenders on their heads. You should definitely check it out. Other notable achievements unlocked at this event was via the purchase of a Spiderman print by Inks MD, which I’ve just mounted on my bedroom wall. I would have loved to walk away from FanCon more broke than I did, but a lot of the merch was not priced favourably in comparison to other sources. Overall, I was super excited to attend FanCon, and next time I may just get a full weekend pass and attend more of the talks and panels. I am a geek. So naturally when self-proclaimed “geek heaven” rolls into my town I am going to show my face and geek out with the best of them. This was the first time attending a Fancon although I did go to Free Comic Book Day before. The geekdom was strong back then and I was anticipating the same for this past weekend. I also had to tell myself that I absolutely could not spend as much money as I did the last time. But more on that later. I was a little surprised that the event was held in the upstairs ballroom area and not the bigger, main expo hall – although another event was taking place there and perhaps FanCon couldn’t fill the entire expo – which understandably is not easy. But when I entered FanCon I was still impressed with what I had seen. Everything from the artwork to the cosplay to the merchandise to the comic books. The entire place was buzzing from the moment I walked in. I got out my camera and walked around pretty much stalking some cosplayers. I donned my Black Panther mask and Deadpool t-shirt and got so much love from my fellow Deadpools. One told me he liked my t-shirt so much that he was going to kill me later and take it from me. Every time I walked past him he would remind me that he still has to kill me later. 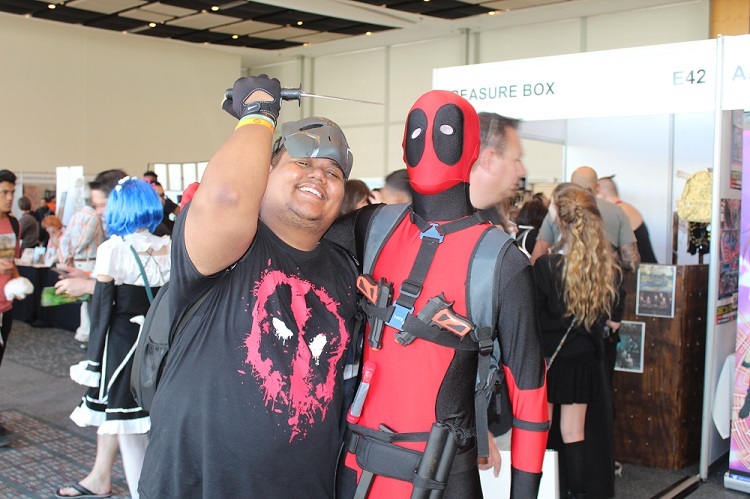 Another Deadpool – in full costume – took a pic with me and let me pretend to stab him in the head. Suddenly I’m craving chimichangas. I took a seat on the Iron Throne and it was surprisingly comfortable. I had to wait behind some other attendees, including one very ominous looking individual. But the biggest battle of the day was how much money I was going to spend. I regrettably spent way more than I should have at Free Comic Book Day – scratch that, I regret nothing – but I am a sensible human being who approaches broke status several weeks before pay day. FanCon was not going to help. I bought a Batman mug which is now the fourth in my collection. Yep, definitely a geek. I also did my part for local comics by purchasing a signed copy of “Rebirth” a vampire story around Jan van Riebeeck. Overall, FanCon was pretty epic. I would have liked to have gone for all three days and see some of the talks and panel discussions but there’s always next time! I cannot wait. You can follow us on Twitter @btglifestyle and click here and LIKE us on Facebook. Subscribe to the BTG Lifestyle blog for updates, and email us at [email protected] if you have feedback, or would like to collaborate with us.